Wealthsimple is one of the most popular robo-advisors around the world, with operations in Canada, the U.S. and U.K. When they launched in Canada in 2014, they ushered in an era of low-cost investing that made it easier for everyday investors to access low-cost exchange traded funds (ETFs). Wealthsimple Trade is their latest product offering. Much has been said about the true impact of high management fees for mutual funds. With current average fees as high as 2.35% for equity mutual funds, Canada has consistently received the award for some of the highest investment fees among developed nations. What high and unrelenting fees do is to dampen the overall returns that mutual fund investors make in the long run, particularly, since mutual fund managers rarely beat their index benchmarks. With their digital wealth (robo-advisor) service, Wealthsimple offers investors a low annual management fee of 0.50% on accounts under $100,000 (Wealthsimple Basic) and 0.40% on accounts that exceed $100K. Not only that, when you sign up using our special promo link, you get to invest up to $10,000 for FREE for one full year! On August 16, 2018, Wealthsimple teased DIY investors in Canada with something exciting – a $0 commission, no account minimum, unlimited FREE trades brokerage service. This trading service was fully launched today and allows you to trade more than 8,000 popular stocks and ETFs listed on major Canadian and U.S. brokerages. Currently, if you wanted to buy and sell individual stocks and ETFs via a self-directed discount brokerage account, you pay up to $9.99 per trade. A zero trading commission for both “buy” and “sell” transactions is a first in the market. Users of Wealthsimple trade have access to a top-notch mobile app that ensures they can trade on the go. Self-directed investors are able to open non-registered investment accounts, and there are plans to support other registered accounts like TFSAs, RRSPs, and RESPs in the future. How To Open a Wealthsimple Trade Account? March 13, 2019 Update: The app is now fully launched. Over 130,000 Canadians signed up to the waiting list and more than 7,000 people tested it. New users can get started with trading in as little as 5 minutes. The Wealthsimple Trade app is available on both iOS and Android. Wealthsimple Trade Zero Fees: How Do They Make Money? Since Wealthsimple Trade will charge $0 trading commissions, it begs the question: “How will they make money?” Businesses exist to make profit, eh? Wealthsimple is the robo-advisor service that offers automated low-fee investing to investors who want a hands-on approach to their portfolio at the lowest fees possible using ETFs. Account holders receive automatic re-balancing of their portfolio and free financial advice. You can open different kinds of accounts including RRSP, TFSA, RESP, RRIF and LIRA (Canada), or Traditional IRA, Roth and SEP IRA’s (United States), and ISA and JISA Individual Savings Accounts (United Kingdom). They also provide non-registered investment accounts in all three countries. Wealthsimple currently have over 100,000 clients and $2.5 billion in assets under management. 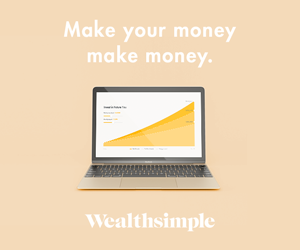 Join Wealthsimple and Get $10,000 Managed FREE For One Year! Wealthsimple Trade will provide a trading service to self-directed investors who want a hands-on approach to their investing and who would like to purchase individual stocks and ETFs to make up their investing portfolio. You can trade with as little as $1 and there are absolutely no fees. Client accounts (Canadian) with both Wealthsimple and Wealthsimple Trade are protected by the Canadian Investor Protection Fund (CIPF) up to $1 million. The prospect of getting to buy and sell ETFs and stocks at zero fees is compelling. While a hands-on investment approach is not for everyone, self-directed investors will be glad to save even more money on their investing. The absence of a minimum balance also means you do not need thousands of dollars to try out DIY investing. Wealthsimple Trade is a $0 commission, no account minimum, and unlimited FREE trades brokerage service. The only caveat is that only Android 6 and higher are supported. Bummer there. Cannot install it on my phone and tablet as they are running 6.0.1 version. Any chance of a demo account…try before you buy type thing. Hearing there is a 15min+ delay on quotes so not ideal for day trading.